This place has it all. 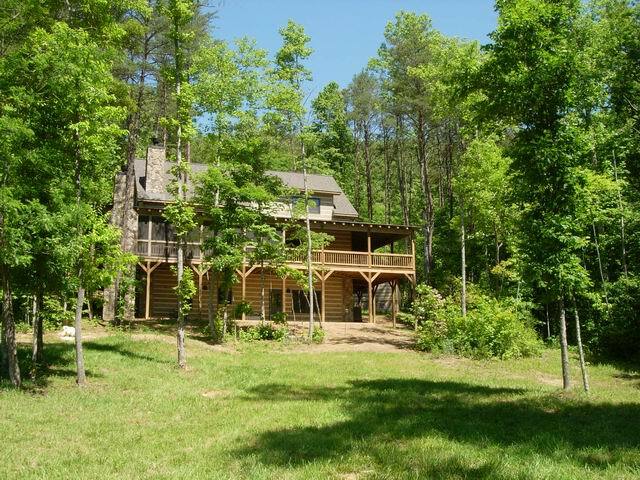 River front, 3 bedroom 2.5 bathroom home along with 1.5 acres on the Hiawassee River and beautiful mountain views. You’ll be close to the John C. Campbell Folk School and minutes from town and Tri County Community College. Rain or shine you can pull up a chair and enjoy the screened in back porch while you listen to the river running past. Head inside and start a roaring fire and just relax. Priced to sell at $325,000 so call Kathy and check this one out before it’s gone, you won’t be disappointed. Bring your bathing suit. This furnished 2 bedroom and 2 bathroom French country style home is waiting for you. Have family and friends over for dinner in your outdoor kitchen and afterwards take a dip in the pool. Just imagine having your choice of cozying up to a warm fire in the master bedroom or in the living room. Take a relaxing snooze in the sunroom or how about starting that hobby you’ve always wanted to begin in the workshop. It doesn’t get much better than this, priced at $239,000 so call Kathy and make an offer. This is country living at its best with this rustic 3 bedroom 2.5 bathroom mountain home. You’ll love the large open floor plan with lots of windows to enjoy the views. This home features the master bedroom on the main floor which will leave plenty of room for guests to enjoy their own space in the upstairs master bedroom and bathroom. Roast marshmallows or hot dogs around the fire-pit with friends and family. Give Kathy a call you’ll want to see this one. Priced to sell at $249,000. Did you know that retirees are now making North Carolina their favorite retirement destination? We have fairly low property taxes and the full time residents can make use of the states homestead laws. North Carolina does not tax social security income and there is no inheritance or estate taxes. North Carolina has what surveys are calling the cool factor. Towns like Murphy and Hayesville are interesting places to live. North Carolina is new and undiscovered, with the added bonus of being not too far away or too different from the Northeast or Midwest that the retirees are moving away from. North Carolina has the allure of 4 distinct seasons, without the extremes when it comes to summer heat or winter cold. Our state also offers many different living environments, not to mention all the amazingly beautiful scenery. All you’ll need to bring is your toothbrush to this fully furnished 2 bedroom 2 bathroom log home with mountain decor. 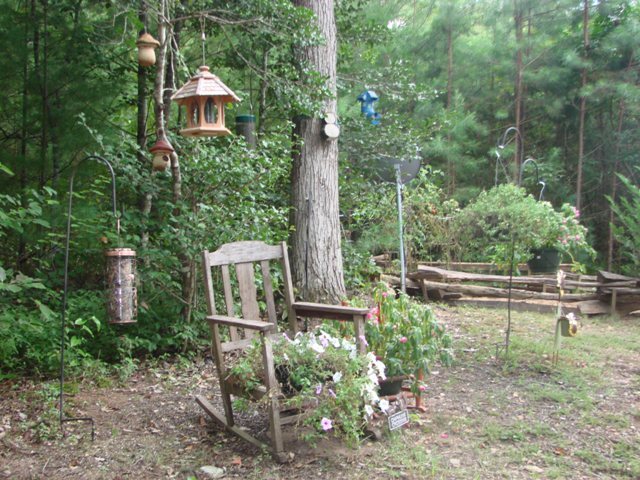 Have a seat and sit a spell on the fully covered front porch and enjoy the private and secluded, wooded setting. You’ll want to fire up the gas log fireplace, just because. The home also features a metal roof, all wood interior; custom made cabinets, cathedral ceiling and walk-in closets. This one is too good to pass by and it’s priced to sell at $149,000. Call Kathy today. You won’t have to look far to satisfy your green thumb with this gardener’s delight mountain cabin. You’ll enjoy the end of the road privacy in this beautiful wooded setting. Pull up a rocking chair and relax on the covered front porch as you take in the scenery. The 2 bedroom 2 bath low maintenance home features vaulted ceilings, walk in closets, gas fireplace, outside storage shed, and community water. Put this home on the top of your list and make it a point to see this perfect getaway in the mountains. Priced at $179,000. CREEK FRONT Custom Built, Pier & Beam, Chink Log Design, Log Home. This home is absolutely incredible. You won’t believe the finishing touches that went into this home. In this private secluded area there are only custom log homes. This home has 3Bedrooms and 4.5Baths and features a family room with 2 bonus rooms in the lower level, double garage (780sqft) w/10ft wide doors, and a breezeway that connects to the home. The home has a full covered wrap porch, for all your entertaining needs, with custom outdoor fireplace, granite kitchen counter tops, stainless appliances, and structured wiring throughout home. The laundry room has custom cabinets and a mud room. This home has a master bedroom and bath on the main floor and then an extra large open loft overlooking the living room, upstairs you have 2 bedrooms and they each have their own private baths. All on 3.31+/-acres of private, wooded, some pasture and borders creek. Wow priced at $499,900 you just have to see this home..